Please note: We are 2 weeks behind on delivery. They are hand assembled by a 78 year-old man. Good ol' fashioned American workmanship. 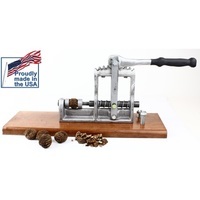 The Master Cracker Black Walnut Cracker is a heavy duty (8 pounds) and durable black walnut cracker that will serve you for years to come. American made, it puts any copy-cat to shame. The most popular copy is a Chinese version, but it's not comparable to the Master Cracker in any way. The Master Cracker cracking cups are deep, allowing for even distribution of energy. This keeps the shells from being crushed and allows for a clean crack. The cracking cup screw is very secure so that it does not create a misalignment while cracking. The spring tension on the handle is also very secure so that there is no wobbling while cracking. The casting is heavy duty, weighing in at 8 pounds 6 ounces. The baseboard that the Master Cracker is mounted on never splinters. The Master Cracker has a rubber handle cover for added comfort.